Humans could have started in America as a jaw from our earliest ancestor found there was dated to 56 million years ago. This makes it at least as old, if not older than previous specimens found in Europe and China, where it was thought the species originated. The size of a mouse, the mammal known as Teilhardina eventually gave rise to today’s monkeys, apes and humans. Only humans spread further than Teilhardina, which was found in the forests of Asia, Europe and North America. The latest study shows that Teilhardina brandti, a species found in Wyoming, is as old or older than its Asian and European relatives, going against the prevailing theory that it first appeared in China. Dr Paul Morse from the University of Florida said: “About 56 million years ago, on an Earth so warm that palm trees graced the Arctic Circle, a mouse-sized primate known as Teilhardina first curled its fingers around a branch. The study, published in the Journal of Human Evolution, studied 163 teeth and jaws in the most comprehensive analysis of T. brandti to date. A team of paleontologists spent years combing the surface of Wyoming’s Bighorn Basin on hands and knees to get bones and teeth from the species. 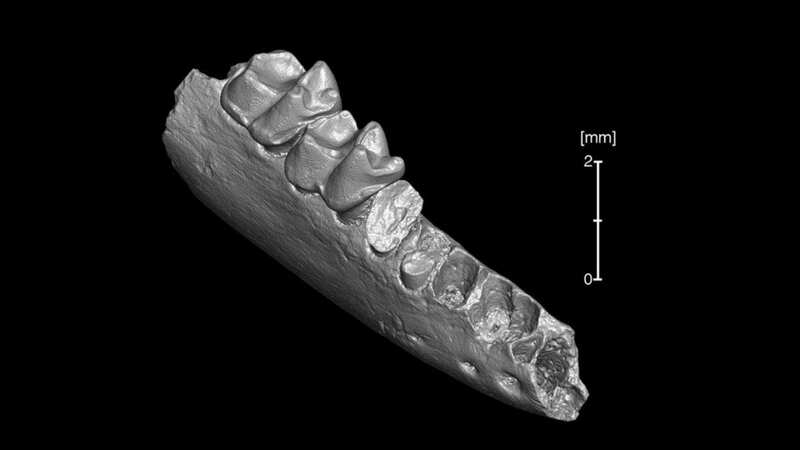 This painstaking search has built up the dental record of T. brandti from a single molar, used to first describe the species in 1993, to hundreds of teeth, providing a broad look at the primate’s population-level variation. But one tooth stood out. Dr Morse said: “Jon and I started arguing about the alveoli, empty tooth sockets and how they didn’t look right at all. “By the end of the day, we realised that specimen completely overturned both the species definition of T. asiatica and part of the rationale for why it is the oldest Teilhardina species. “There’s likely a tremendous amount of variation in the fossil record, but it’s extremely difficult to capture and measure when you have a small sample size. The analysis also reshuffled the Teilhardina family tree, reducing the number of described species from nine to six and reclassifying two species as members of a new genus. Teilhardina appeared during a brief 200,000-year period known as the Paleocene-Eocene Thermal Maximum, or PETM. This era was characterized by a massive injection of carbon into the Earth’s atmosphere, which sent global temperatures soaring. Sea levels surged by 220 feet, ecosystems were overhauled and the waters at the North Pole warmed to 74 degrees. Dr Bloch said: “The humblest statement would be to say that these species are essentially equivalent in age. Dr Bloch added: “This dance of plants and animals with climate change happened over vast landscapes, with forests moving from the Gulf Coast to the Rocky Mountains in just a few thousand years. “Teilhardina likely tracked the shifts in its forest habitats across the land bridges that then connected North America, Greenland and Eurasia. While it was well-suited to Earth’s hothouse environment, Teilhardina disappeared with the PETM, replaced by new and physically distinct primates.